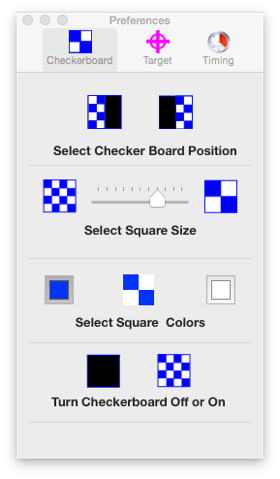 HemiStimOSX for Mac provides visual stimulation through utilizing color patterns and eye tracking that can be used for specific left or right visual exercise. The stimulus is recognized and interpreted by the contralateral (opposite) occipital lobe. 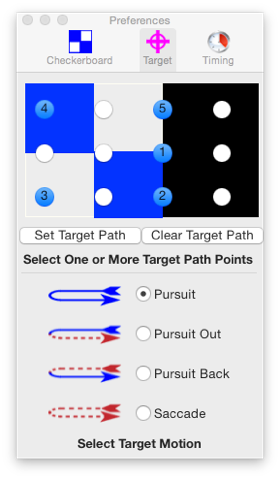 Pursuit and saccadic eye movements are created by targeting on the moving object. Pursuit away from and saccade towards the alternating squares are initiated by the ipsilateral (same side) parietal and frontal cortex, respectively. This gives the doctor the ability to work the frontal, parietal, occipital, and temporal lobes hemispherically. HemiStimOSX for Mac can be used as a visual stimulation of areas of the frontal, parietal, occipital, and temporal lobes hemispherically. It is a specific brain stimulation which is rarely used in conjunction with other treatments but can be used as a portion of a home-based program or an office-based program. Such usage may lead to improved hemispheric connectivity specific, targeted areas of the brain and its connections to the parietal/temporal or frontal cortices. 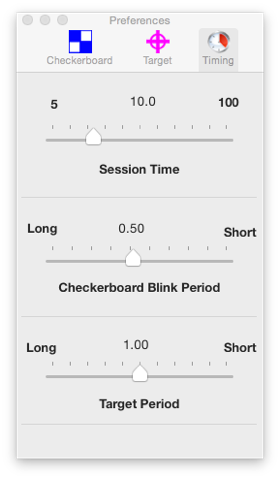 HemiStimOSX for Mac is a companion to our iOS app, HemiStim. It is designed to use the larger screen size of a Mac and provides greater flexibility in designing stimulation patterns. Select one to twelve dots to define a path. The target will follow the points in numerical order and return along the same points in reverse order. Set the Target Path once the path has been chosen. Clear the Target Path to restore the default setting. Choose whether the target motion is pure pursuit, pursuit in one direction and saccade in the other, or pure saccade. Choose how long the animation should last. Choose how fast the checkerboard should blink. Choose how fast the target should move.